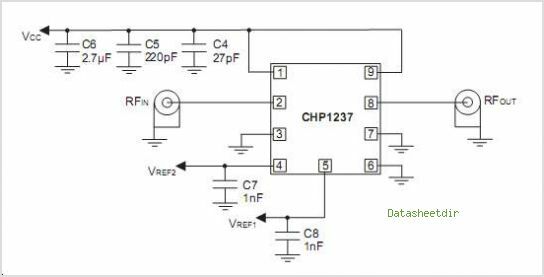 CHP1237 is an InGaP HBT Amplifier Module offering high performance for PCS CDMA Wireless handsets. It consists of a two-stage Amplifier 50 matching network for both input and output, and a bias control circuit. It is packaged in a 3 x 3 x 1 mm package using proprietary Passive-Free Technology (PFT) TM. The package provides excellent electrical stability and low thermal resistance. By Anadigics, Inc. This is one package pinout of CHP1237,If you need more pinouts please download CHP1237's pdf datasheet. This is one application circuit of CHP1237,If you need more circuits,please download CHP1237's pdf datasheet.